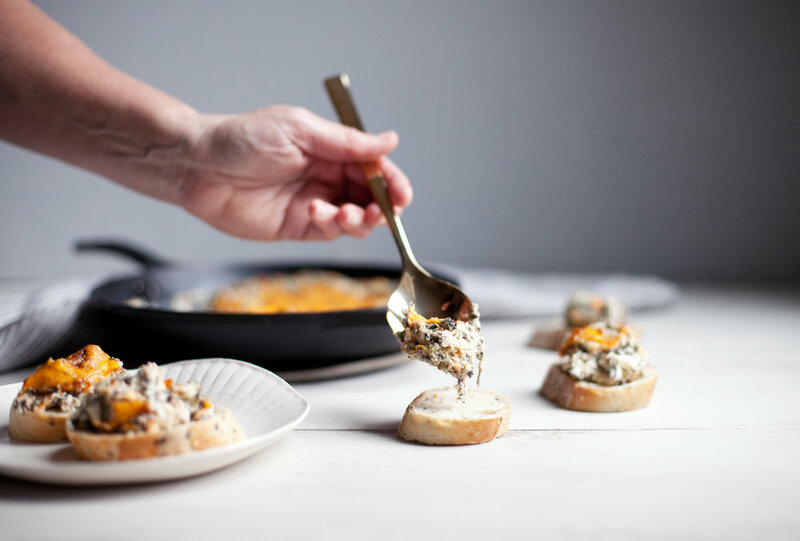 who doesn't love a classic artichoke & spinach dip!?! i am partnering with vitamix today to share the ultimate holiday starter. 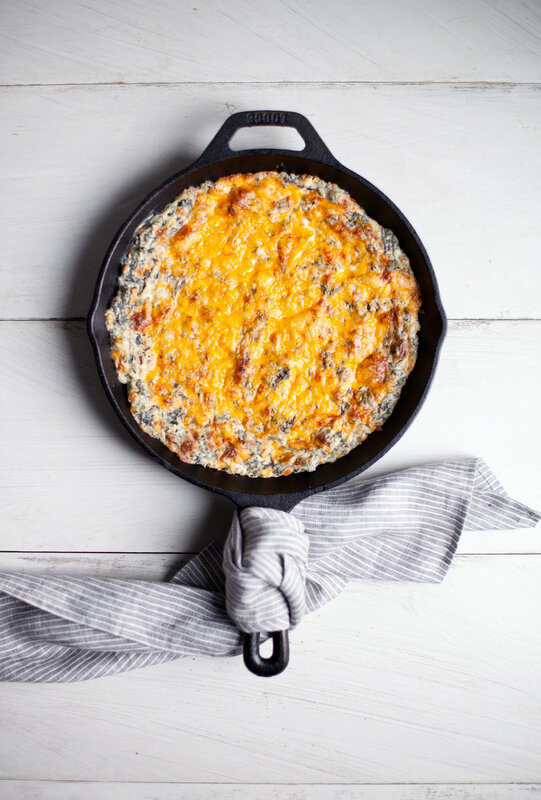 i thought something warmy & cheesy would make for the perfect dish to serve at any gathering! this one earns bonus points because you can prepare it in advance & bake it when you are ready to serve. anything that involves minimal prep the day of christmas dinner earns a gold star in my books! 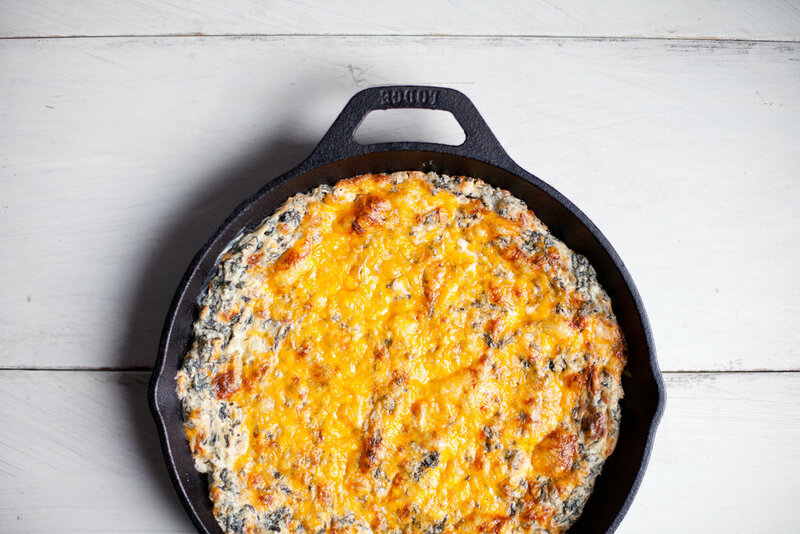 the presentation of this dip looks so inviting & rustic when served in a cast iron pot. the little twist i did from the classic version was use an aged cheddar cheese over parmesan. i love the flavour it adds & the gooey melt factor. while i served mine with freshly toasted baguette slices, you can serve it with just about anything you like! tortilla chips, pita, nann bread & so on. NOW..i have made two versions of this in my vitamix, a hot dip (which you see here) & a cold dip (which turns out a vibrant green colour). while the hot dip is much more indulgent, the cold dip is perfect for serving along side raw vegetables. it involves the exact same ingredients below but everything gets pureed in the vitamix & served as is. no heating involved! because of the green colour the spinach turns it, we call this one the grinch's dip:) as for the hot one, everything but the spinach, artichoke hearts & cheese gets pureed in the blender. then i fold those ingredients into the mix to add texture & depth to the final dish. place the cream cheese, sour cream, mayonnaise, shallots, garlic, salt & pepper into the vitamix. pulse until ingredients are well blended. pour into a mixing bowl. fold in the strained spinach, artichokes & cheddar cheese. 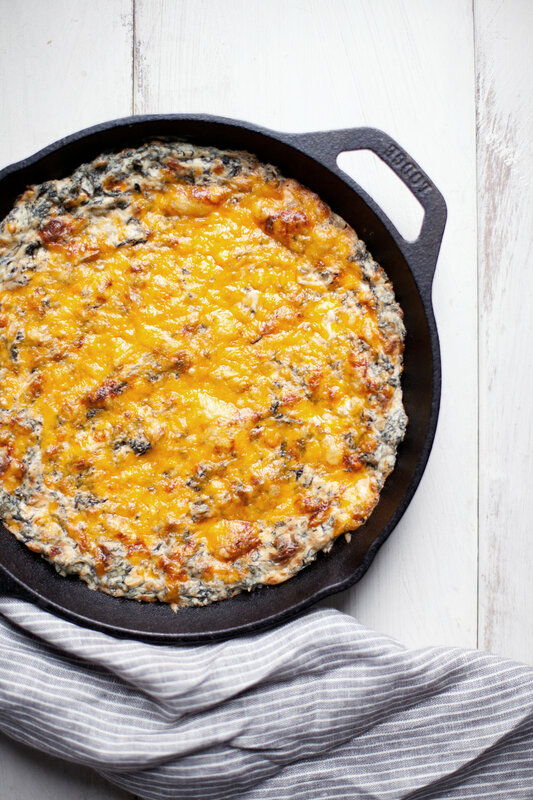 transfer to an oven safe skillet or baking dish & top with additional cheddar cheese. bake for 20-25 minutes or until cheese is melted & browned (broil for a minute or two to crisp the cheese). serve immediately with toasted baguette or warm pita. this post was created in partnership with vitamix! you can find the gorgeous copper vitamix i use here. thank you for supporting the brands that keep me doing what i love!